Created by Joseph Campbell in his book The Hero with a Thousand Faces, the Hero’s Journey or ‘Monomyth’ is a framework used to create a compelling narrative based on myths and stories from a broad range of cultures. The Monomyth definition is a story with a protagonist starting out in their ordinary world, travelling into the special world, dealing with tests and ordeals (obstacles) before being rewarded (goal) and ultimately returning to the ordinary world in a changed state. The Hero’s Journey has since been adapted by Christopher Vogler into twelve distinct stages using clearer language and has been successfully applied to a number of popular movies such as Star Wars. What are the Hero’s Journey Steps? Ordinary World: the hero’s starting place – everyday life. Identifiable to audience. Normal life. Call To Adventure: presented with an opportunity or calling or reacting to danger. Disrupts normal world. The start of the adventure. Refusal Of The Call: the call is attractive but contains major complications and possible extreme consequences. Self doubt takes over. Retreats back into a comfort zone, the protagonist is believable as a character. Crossing The Threshold: ready or not, the hero starts the challenge and faces fear of the unknown. Leaves the normal world for the special world. Tests, Allies, Enemies: various mini-tests and challenges are faced, obstacles to the goal are overcome. Gets to grips with new rules of the special world, players involved, politics, dangers. Upskills for the challenges ahead. Approach To The Inmost Cave: final preparations leading up to the main challenge to the goal. Setbacks lead to new approaches. Ordeal: Campbell refers to this as the ‘belly of the whale’, and this is the big challenge. Failure is not an option! This can be a highly tense affair with the hero metaphorically dying followed by resurrection and ultimate success. Reward: the hero is successful, has greater powers such as new knowledge, confidence, holds an alternative outlook or receives a tangible reward. The goal is achieved. The Road Back: trappings of success make it difficult to go back to the normal world. Also enemies might make a last minute attempt to thwart the hero’s success or escape. Resurrection: a final battle, failure can have drastic consequences in the normal world. Uses new skills to overcome obstacle. Return With The Elixir: hero returns in a changed state. Any issues with ordinary world characters are resolved. Hero uses newly acquired knowledge to great effect. Why is the Hero’s Journey useful? The Hero’s Journey can act as a guide in writing your story as it builds structure, characters and engagement. It supports the three-act structure and develops a full character arc that resonates with a global audience. If used in scenario writing, it can help increase the emotional involvement of the audience leading to greater engagement. 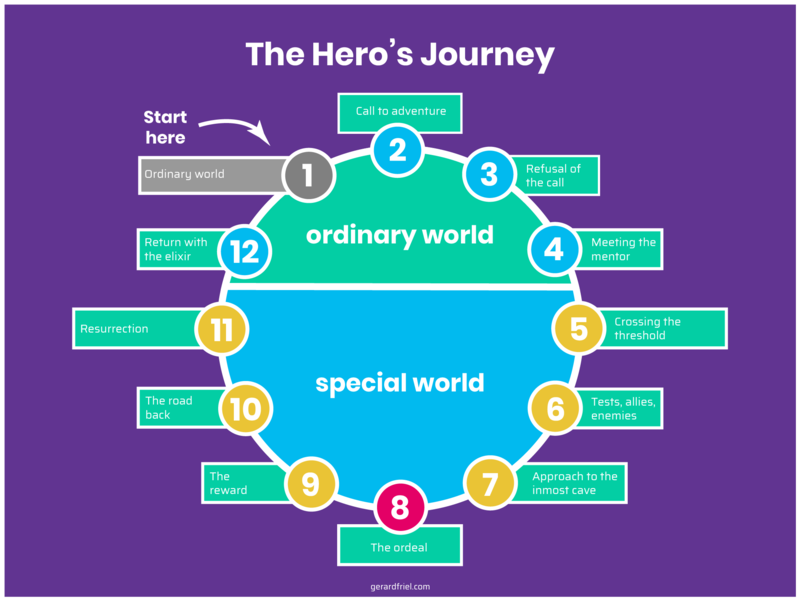 How can the Hero’s Journey be used in Learning? For short learning stories or scenarios, you don’t have to use all twelve stages. However, the protagonist should transit from the ordinary to the special world, overcome a significant challenge and return back to the ordinary world a changed character. This will resonate with audiences and highlight the transformation or learning that has taken place.